This volunteer evaluation recently came in from member Zohra Kalinkowitz. We asked Jineth to tell us more about herself and why she chose to volunteer at Ashby Village. My name is Jineth Campos. I'm 26 years old. I'm originally from Bogota, Colombia. 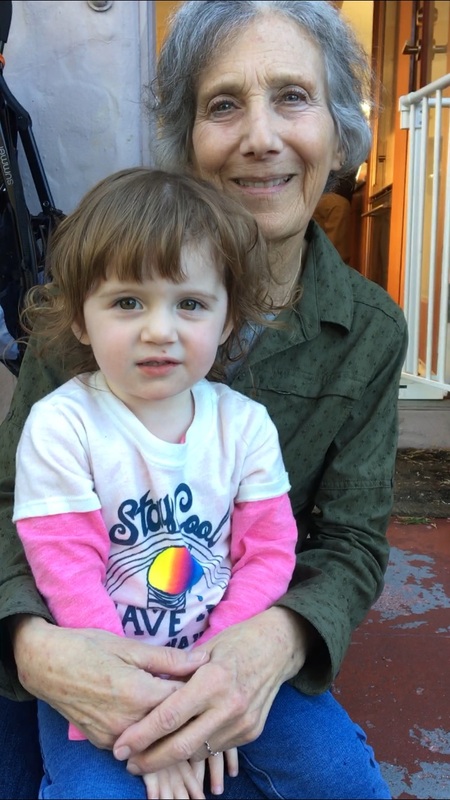 I came to Berkeley, California in 2014 as an aupaircaring for two boys. I fell in love with Berkeley and the American culture. Following my two-year program exchange, I decided to extend my stay in the Bay Area. Now, I'm an international student of Business Administration at Berkeley City College. My goal is to transfer to UC Berkeley or San Francisco State next year. I'm passionate about customer service. I was a professional waitress and cashier in my hometown for 5 years in the hospitality industry. I felt that being in Berkeley for so long I should do something for the community. Several reasons attracted me to volunteering at Ashby Village. One of the reasons is because I like to work with other people, side by side, joining forces, sharing experiences, and learning from each other, walking and growing together. As a volunteer in Ashby Village, I feel like an agent of change who gives help and a bit of her time and experience to improve things. What I most like about Ashby Village and the community in Berkeley is that people unite to get better together and the compassion people have to support others even when they don't know each other. My experience with Ashby Village has been a great step on a personal level and it has helped me to know and understand our elders. Helping them with some of the tasks that are difficult has been a pleasure and a unique experience. I remember working with Zohra Kalinkowitz to lay out some mulch in her front garden. We had so much fun talking about gardening. I did not have much knowledge about it and I learned with her. I was also happy to practice Spanish with her. Thank you, Zohra! Ashby Village gives me the opportunity to help, share, and support older adults. Surrounded by the Ashby Village community reminds me of the great moments I used to have with my grandmother, listening to her stories from her childhood, her fantasy tellings, and all her teachings. Being far away from my country, I think that if I cannot share as much as I want with my family and grandmother, I should share my generosity, solidarity, altruism, empathy, freedom, honesty, tolerance, and sincerity with the community in which I find myself. Perhaps, God will be satisfied with my work as a volunteer in such a wonderful place as it is Ashby Village. ... What can we say about Saturday's celebration of our Ashby Village volunteers? There are so many superlatives. " Classy" comes to mind first. Then of course there is "creative" and "thoughtful". Check out the video and photos from the event here! You are truly the cornerstone of Ashby Village; people we need, trust and value. 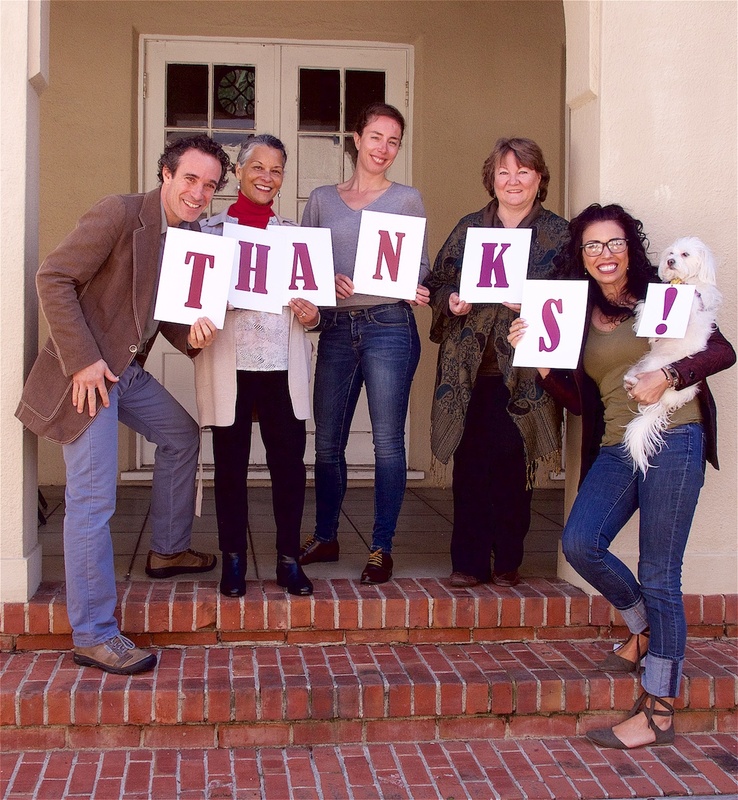 To the outstanding and remarkable folks who have chosen to volunteer their time and energy to support our members – whether it’s through direct services, important programs or helping in the office – THANK YOU! You give of yourself and bring with you your life experiences, skills, abilities, compassion, intellect and humor. We trust that the satisfaction of giving back, friendships and fun are some of the rewards that you gain from volunteering with our Village. More details to follow but be aware: we have some exciting things planned! Kate, who worked for 32 years as a registered nurse, enjoys making sure that member needs are met. A substantial amount of her time is on the telephone, making a connection, answering questions, speaking with prospective members, and putting members in touch with resources. Claire Zhang, an international student from China, recently completed an Ashby Village summer internship as assistant to Andy Gaines and Manuela Pegoraro. Claire was attracted to the Ashby Village opening because she had enjoyed previous volunteer work with older adults. This was her first placement in an office. Claire credits Andy and Manuela for being great mentors, “They were so nice and patient, willing to discuss the work, and encouraging me to take initiative.” Claire also found Ashby Village a workplace that demonstrates that an office can be both productive and supportive. Claire has been in the U.S. for two years, and is enjoying busy college life at Berkeley Community College. She hopes to transfer to UC Berkeley and earn a degree in Psychology. The Gentle Yoga class meets at The Yoga Room in Berkeley.The size of the class varies, usually 15-20 people. “No one is left out.” Ada explains. “The group functions in a community and makes sure everyone is O.K. I begin by checking in with each student to find out their medical issues, joint replacements, and concerns. The class is in three parts: 1. Balance and strengthening, done seated or using a chair to balance; 2. floor work on stretching poses; and 3. Deep relaxation. For parts 2 & 3 of class, students must be able to transfer to the floor and back up again. 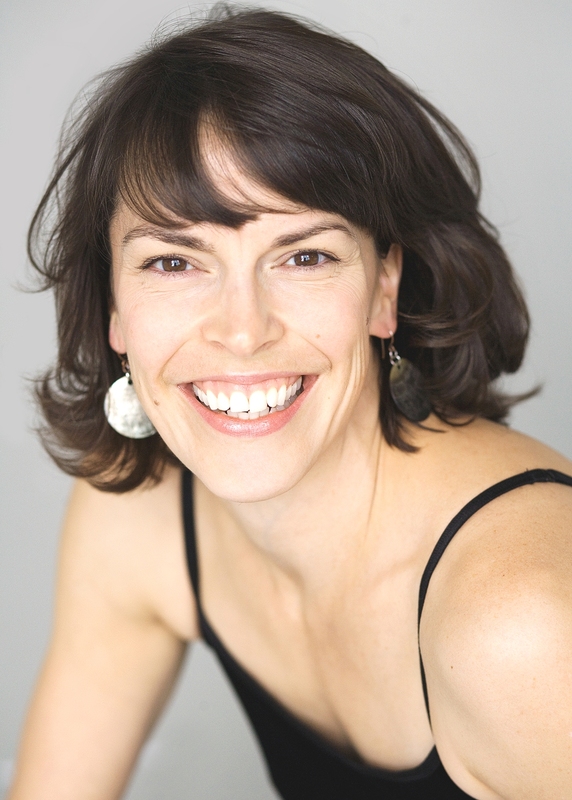 Click the link to get a glimpse of Gentle Yoga at Ada’s website. 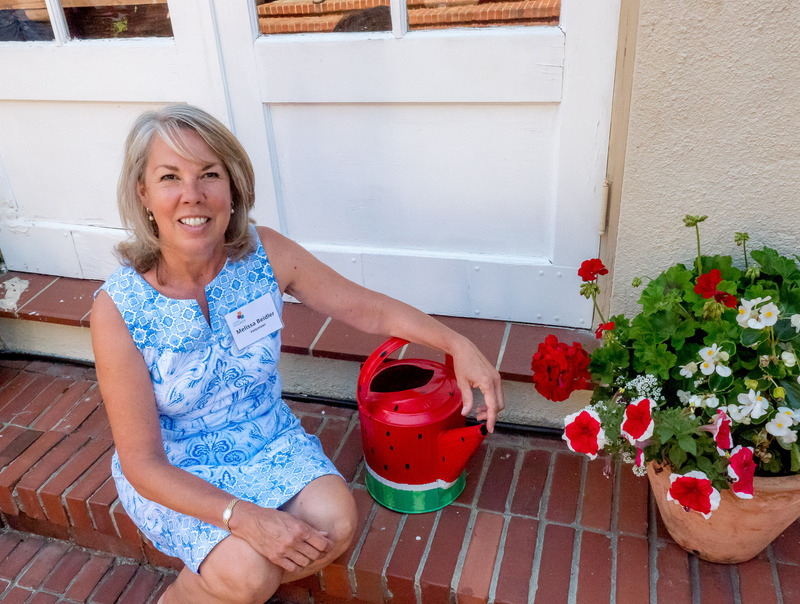 The volunteer behind the Beautification Team’s rejuvenation of the patio at Ashby Village’s new site is on a mission to revive beloved gardens that need attention. Melissa Beidler took a break from working on her own garden to share her enthusiasm for people and their gardens. Melissa attributes her passion for gardens and working with plants to her mother and grandmother, both “fabulous gardeners.” When she retired after 30 years in banking and financial services, Melissa scanned volunteer.org for ways to share gardening skills honed over generations. She applied her business skills to the patio project at Ashby Village’s new site, creating a project plan, timetable, and budget. The Beautification Team created a spectacular place for the people of the Ashby Village community to get together for a cup of tea, a moment of reflection, or events such as the Festival Italiano Volunteer Appreciation. People appreciate the colorful backdrop of the patio when attending events in the Julia Morgan Hall. 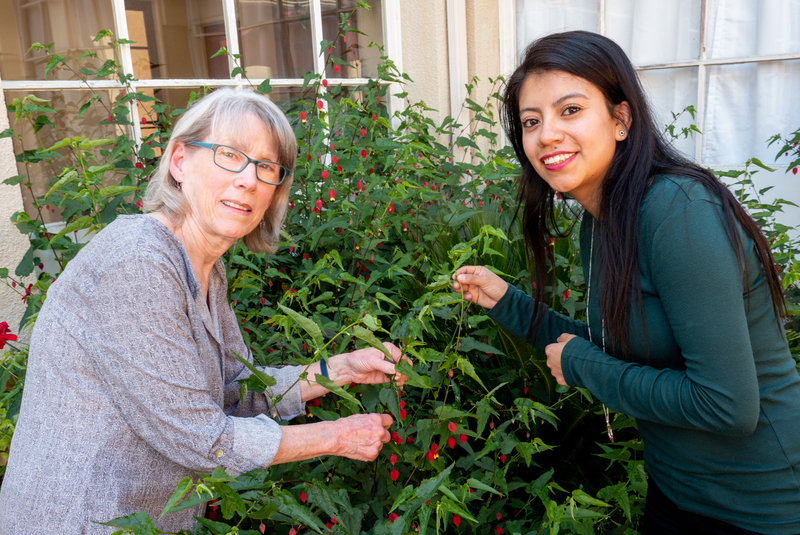 Melissa enjoys working with individual members to revitalize gardens they may have tended for years. “I can tell that, not too long ago, some of these gardens were spectacular. For many of us, the garden is the most important part of the home; but gardening is hard work and it can be difficult to see things get out of shape.” As a volunteer, Melissa loves helping members rethink more manageable gardens or refresh what is already there. Her goal is to leave a visually pleasing garden, where people can relax, enjoy happy memories, and delight in watching their gardens grow. It is easy to get on a list for volunteer gardening help. Just contact the Ashby Village Office at (510) 204-9200. It is often said that the lifeblood of Ashby Village's culture of giving is its 320 volunteers, many of whom are also members. On June 3, the Ashby Village community celebrated volunteers at Festival Italiano. The office courtyard was transitioned into an Italian piazza decorated with Italian colors and featured an espresso bar and specialty cocktails of prosecco and elderflower syrup... Read more and watch the video of the event! "ashby village makes a whole lot of sense"
In recognition of National LGBTQ Pride Month this June we celebrate community-building through increased awareness, interaction, and inclusion. We also spoke with someone engaged in making that happen within the Ashby Village community. 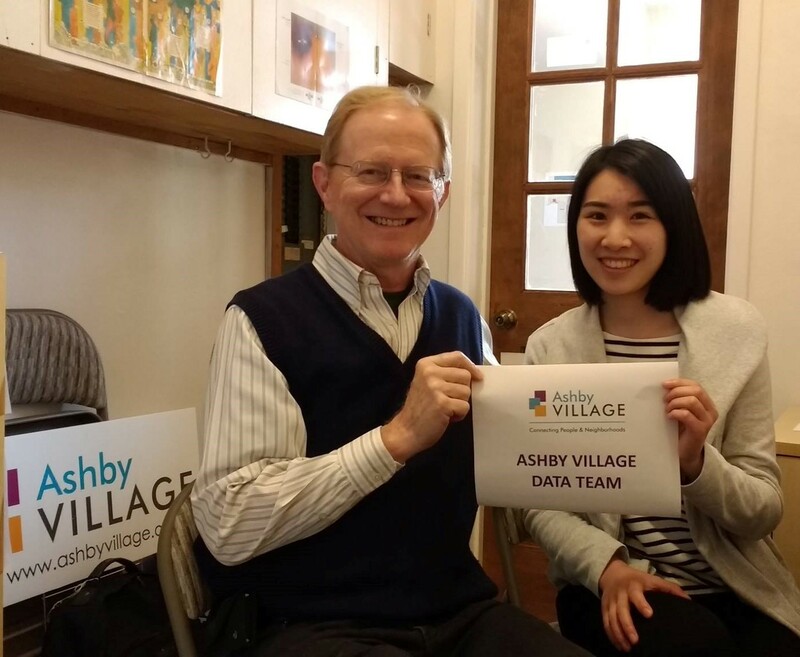 A founding member of Ashby Village’s LGBTQQA Interest Group, Gordon applauds Ashby Village’s efforts to build an inclusive community that mirrors Berkeley’s diversity. “As we grow older, relationships change. People may become marginalized and isolated and feel afraid to talk about who they were and are. Some people go back into the closet. The interest group gives us others to talk with and a path to promote understanding and interaction.” And LGBTQQA elders have insights that can help others aging in place. 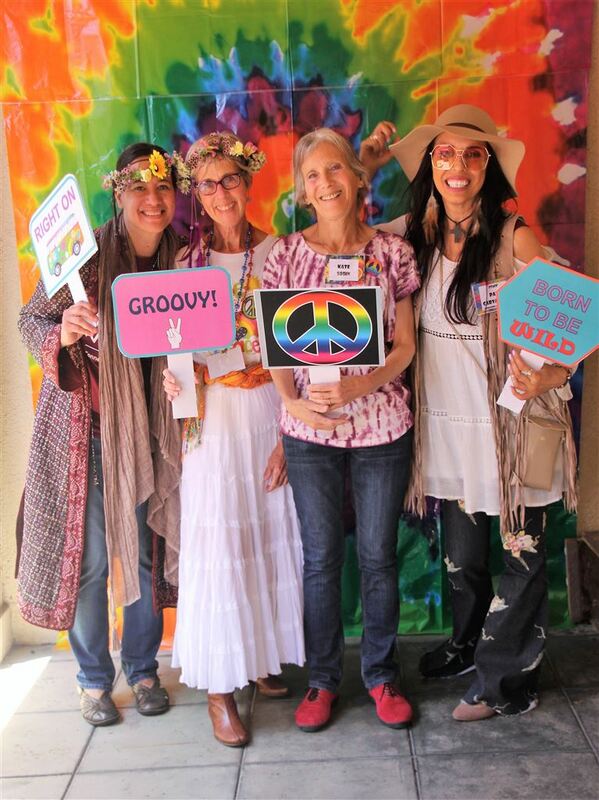 Statistics from the work of Dr. De Vries, cited in the Village Voices May issue, show that 75% of LGBTQ boomers said being LGBTQ helps prepare them for the challenges of aging. Following his retirement from Schwab in 2000, Gordon volunteered for a number of organizations, acting as a docent for President Roosevelt’s yacht USS Potomac, docked at Jack London Square, the Rosie the Riveter WWII Home Front Education Center, and Victory Ships in Richmond’s Henry J. Kaiser Shipyard. 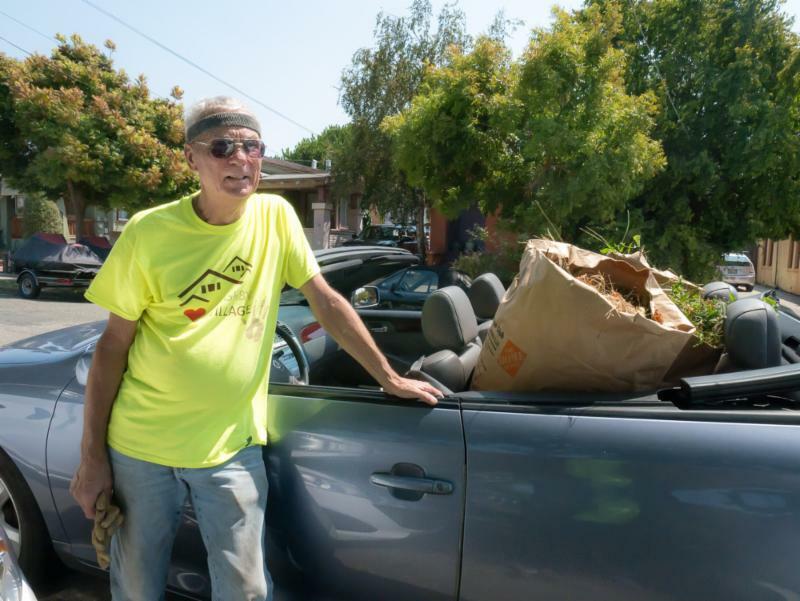 He also volunteers as a first grade teacher assistant at Henry J. Kaiser Elementary School and at the Alameda County Food Bank. Paired with his personal experience assisting elders, Gordon’s work as an AARP Foundation Tax Aid volunteer made him aware of the thousands of elders “going it alone” and the tremendous struggles people can face if they grow old in isolation. A friendly visit or a ride to the doctor would mean so much. “This is where the village movement can make such a huge difference,” Gordon observes. He sees an enormous potential for growth in the village movement and believes that local press coverage and member referrals are the most effective ways to take it to scale. “It’s a real thrill when I can fix something,” says Sam Duncan, an Ashby Village technology volunteer. And he means it. When contacted for this interview, the first thing Sam wanted to know was whether the newsletter was having any technology problems. “I have no idea what I would have done if I were not living in the time of computers,” he says. Sam was hooked the moment his roommate at MIT introduced him to computers. He went on to spend most of his career programming in defense and aerospace as well as teaching computer courses. The other thing Sam loves most about volunteering is figuring out how to solve computer problems. “I know what it is like not to have a computer that works. No one should ever feel stupid about having a problem,” he says. 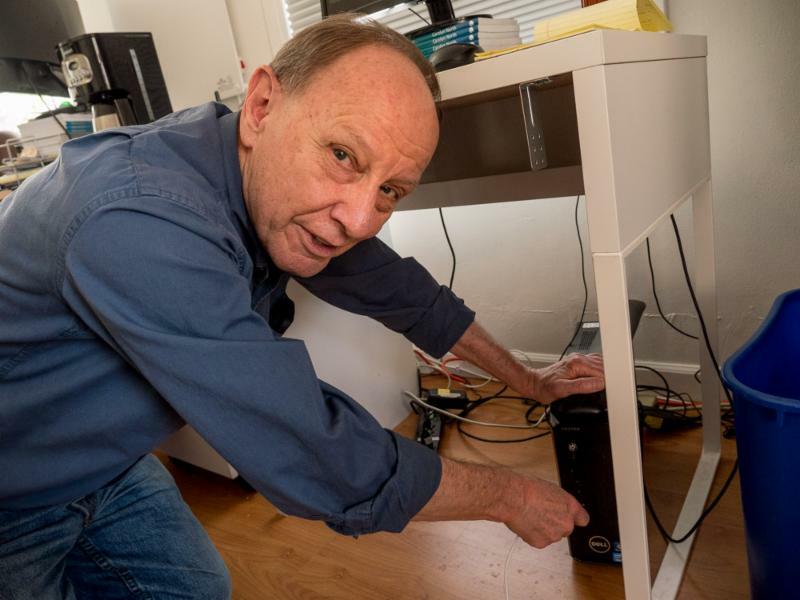 The problem could be with an Internet provider, faulty hardware or software, or maybe even a plug slightly pulled out of the outlet. In addition to trouble-shooting, Sam gives personal tutorials, helping members establish their connections to Village resources, navigate the website, store addresses or photos, connect to social media, install apps to get services, Skype with family and friends, view an exercise video, listen to a podcast, or set up a Facebook profile. What does Sam recommend if something goes wrong with a computer? Sam’s strategy is to look up the problem on Google, because “it has probably happened to someone else who posted a solution.” Try to keep calm and rest assured that Sam and the other technology volunteers will be there for you.